Although it is not impossible, getting a nice house is not easy. In fact, although it is not necessary to have a lot of budget, if you requires time and basic knowledge of decoration. Luckily, here you can find all the tips and ideas necessary to prepare any room in your home. Keeping in mind that your home says a lot about you, it is essential that you do everything possible to keep it clean and orderly. In this sense, it is important to keep in mind that some decorating mistakes can make your home look dirty and disorganized even if you have spent hours for cleaning. Today we talk to you about 10 of these errors. If you know them, it will be much easier to avoid them. First of all, we want to recommend that you avoid open cupboards or glass doors, especially if you are not an orderly person, since it let you see the whole interior. The same goes for the open shelves. Think that this type of furniture forces you to have the interior completely organized. One mistake that can make your house look messy is not having the necessary storage systems. If your home has a few square meters and you cannot enter the number of pieces of furniture that you would like, then it is better to choose multifunctional furniture. Another typical mistake is not having organizers in the drawers. Believe it or not, these elements not only allow the interior of the storage systems to be organized, but also make them fit more. Therefore, you will not have to leave objects outside the cabinets and drawers. 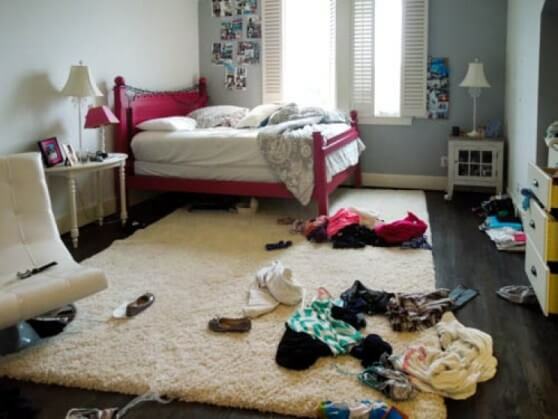 Believe it or not, having a picture or a bad hung from the mirror in your home can make your house will be messy. So that this does not happen to you, you should hang the picture in order. Other elements that can make your house look messy and dirty are the cables, which are better kept hidden. As we have mentioned on previous occasions, the receiver acts as a kind of introductory letter to your home. Therefore, if part of your home is neglected or untidy, all your guests will get the impression that your house is dirty and disorganized. Entering too many decorative objects in a room can also cause it to look very messy. Therefore, unless you like eclectic decoration, it is best to let yourself be carried by the maxim of “less is more”. The cushions in beds and sofas convey a feeling of warmth and comfort. However, abuse of these decorative complements is not highly recommended, among other things because it is most likely that some end up being out of place. Introducing plants in the home is practically essential. However, if you do not have time to take care of them, it is better to avoid them. In addition, you must take into account that if you do not have time to water the natural ones, you do not need to remove the dust from the artificial ones. Finally, we want to say that the excess of artificial light, especially if it is very bright, can cause all the defects and disorders that will be seen more. The ideal thing is that you bet on warm lights and place them strategically.